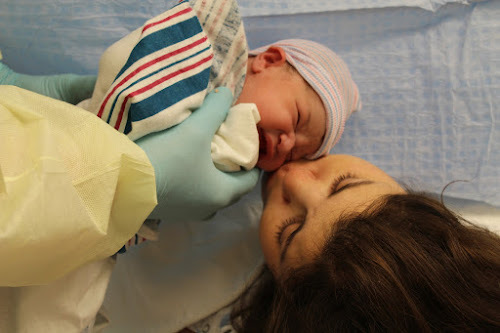 I’ve always enjoyed hearing other moms tell their birth stories and it wasn’t until I was finally in the hospital that I realized mine was unraveling in real time. 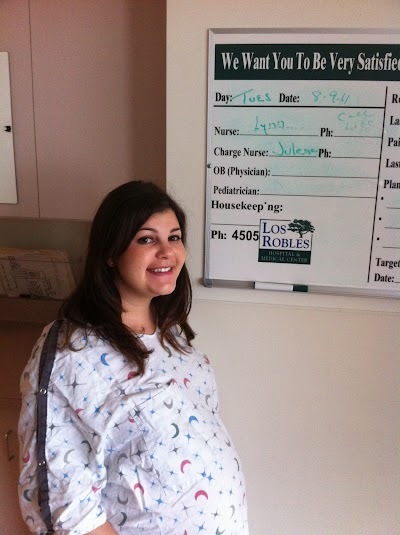 On Tuesday morning, August 9th, we arrived at Los Robles Hospital at 7:15 to check in for our induction. I was a ball of nerves. 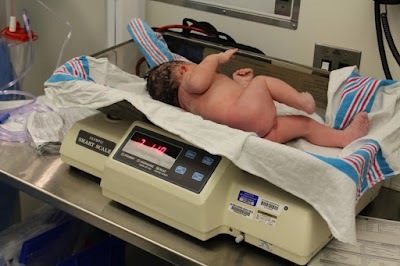 I didn’t really want to be induced, but it was fine time the baby arrive and I knew I was in good hands. We were officially admitted and checked into our room where Lynn, one of our favorite nurses, greeted us and gave us the scoop on the day’s upcoming events. At about 11:30 a.m., Dr. Hunk (that’s not his real name. 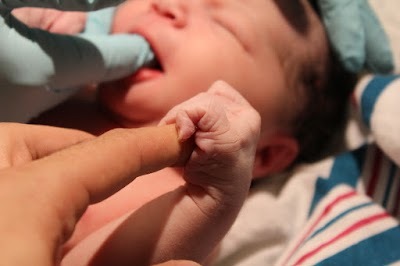 He was just a total dreamboat) came in and administered the epidural. To say I was nervous about it would be an understatement. I was shaking and had a garden of butterflies floating around my tummy! 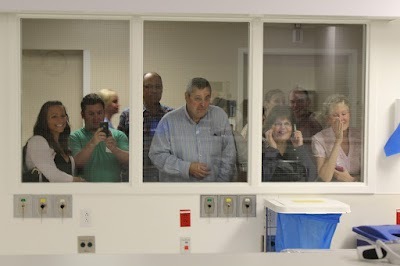 The anticipation, of course, was worse than the actual procedure, but it was all very odd and just… weird. Soon enough, my legs and belly began to drift off into nothingness and I lost any possible pain from the contractions. The family would remark on the severity of a contraction and it was nice to be able to shrug my shoulders and go “eh, okay!” because I didn’t even know I was having one! We kept ourselves occupied with conversation, music, and of course our iPhones. It was funny to see the two sets of parents, Bryan, and me, all on our phones either playing Words with Friends or exploring Facebook (It’s no surprise to anyone which iPhone application I was utilizing!). 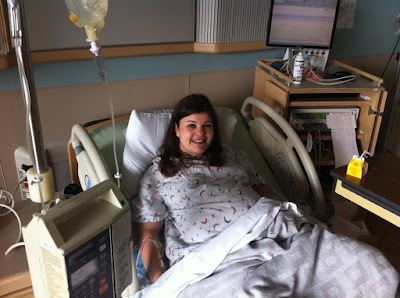 People teased that I was on Facebook during labor, but really, I was just laying there and not feeling anything. Could’ve been a lazy Saturday morning in bed! 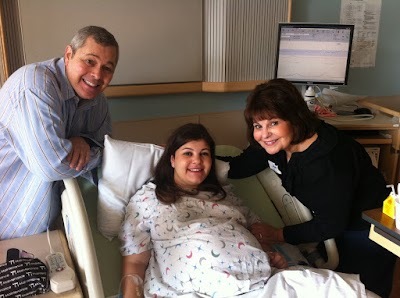 The afternoon progressed and with it, so did my contractions and dilation. Baby was moving down and the cervix was dilating and preparing us for a delivery by day’s end. Everyone was happy with the speed and timing of the labor, and by around 6 p.m., Dr. Fiiiine predicted an early evening welcome to our new Baby. The nurse came and checked me soon after and noticed a swollen part of the cervix that hadn’t been there the rest of the day. She didn’t say it was a bad thing, but was concerned about it slowing down the labor. 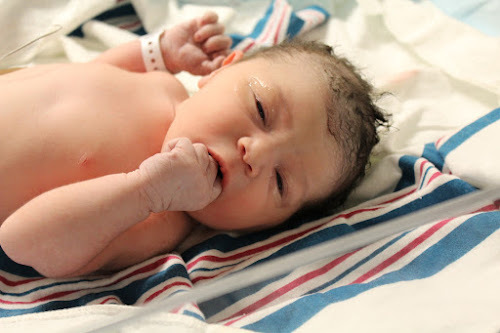 At about 9 p.m. things were the same: I was dilated about 9 cm, Baby was in the ready position with her head trying to poke through the cervix, but that swollen spot persisted and Dr. Fiiiine said she’d give it another hour and then we’d have to talk. You know where this is going. Even I knew where this was going. Why would things suddenly improve in an hour? What could possibly make that one little part of my cervix un-swell? Things had been going so nicely that surely, I couldn’t stay in paradise forever. And, I was right. At 10 p.m., Dr. Fiiiine arrived to check again and, as I predicted, no change. 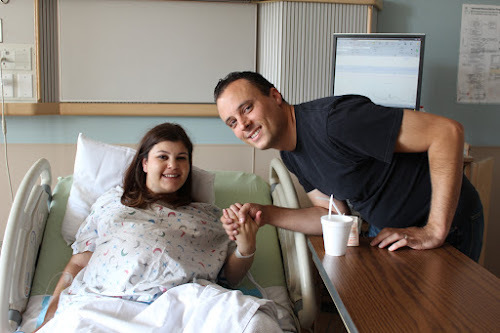 She explained to me that we could keep waiting, possibly put the baby in distress, have a very dramatic delivery that might end up in a C-Section anyway, or just do a C-Section now and have a safe, easy delivery for both Baby and me. I was also starting to develop a fever, which worried the nurses and Dr. Fiiiine because it meant that there was an infection brewing. 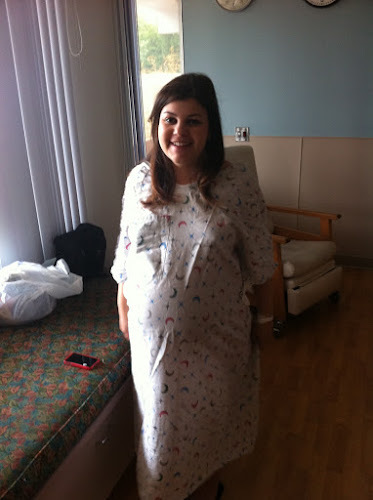 The baby would need to come out soon because frankly, the waiting game was over. She reassured me this had nothing to do with the induction, and that this was an unfortunate situation of my anatomy. I probably wouldn’t have been able to deliver this way even if I’d gone into labor naturally. Through lots of tears and a big ugly cry, we agreed it was the best thing to do. Since I’ve never had a surgery that I can remember, I was very scared of going under the knife and the recovery that would come with it. I had read that the bonding experience with the baby isn’t as immediate or as intense because of the need to keep the environment sterile and to check the baby right after surgery. I was bummed that Bryan would not be “coaching” me the way we’d practiced, and deep down, I felt a little bit cheated out of a female experience. I do know and acknowledge that carrying a baby for 40 weeks (or any length of time) and delivering it (in any capacity) is the most female thing a woman can do, no matter how the baby arrives. But in my moment of panic and distress, these were the things that ran through my head as I produced golf ball tears. I kissed my family and Bryan, exchanged “I love you”s and before I knew it, I was being wheeled into the operating room. I really don’t remember much about the surgery. 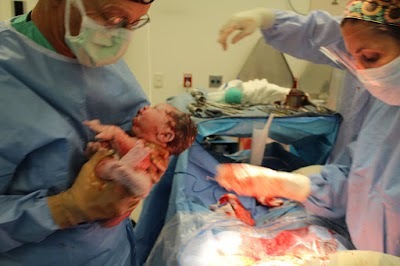 I was awake for almost all of it, and I was very aware of what was going on in the moment, but in the days of recovery and settling in at home, the actual C-Section seems like such a blur in my memory. I remember the nurses prepping my body and the room, Dr. Hunk hooking up my IV with more serious numbing drugs and hooking up my iPod for some operating tunes (thank you Dave Matthews for getting me through my baby’s birth! ), and Bryan arriving in the OR in his scrubs with camera in hand and sitting right next to me as we were both in awe of what was going on. The OR experience was just like ones we’ve seen on medical TV shows: Doctors and nurses having casual conversation over my body while also exchanging orders in medical jargon. Very surreal. With a little tugging and prodding, our baby was scooped out about five minutes after the surgery started and I heard her big cry! I couldn’t see her yet, but I remember Dr. Fiiiine declaring her a beauty and reporting she had a full head of dark hair. 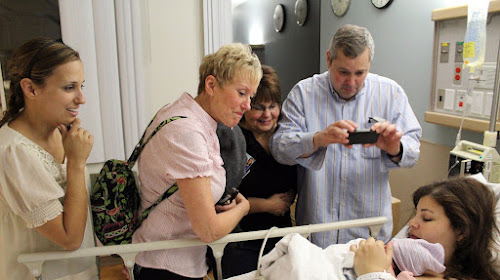 I got very choked up and anxious to see our daughter, and finally, they waved her in front of me so I could get a glimpse and then brought her to my left where the nurses and Bryan helped to clean her up and check her vitals. She scored a 9 on both APGAR tests (valedictorian of her APGAR class!) and was perfectly healthy in all other ways! So, at 10:25 p.m. weighing in at 7 pounds, 11 ounces, our Madelyn Shana was born. I got to give her a kiss and hold her for some quick pictures before Bryan went with the nurses and our newborn Madelyn. I, obviously, stayed behind to get sewed up and put back together. This process normally takes about 30 minutes, but apparently I was a bleeder, and my insides gave Dr. Fiiiine and her assistant/father/doctor who delivered me in 1983 a tough time closing me up. From all the pushing and grasping, I started to feel very nauseated and told Dr. Hunk, who was behind me at my head, that I was going to throw up… right… NOW… and in an instant, a suction tube was in my mouth and I was dry heaving like there was no tomorrow. Not too fun, I tell ya. He said he’d give me a little something to take away the nausea. The “little something,” I found out later, was Michael Jackson’s drug of choice, Propofol, which gave me a niiiiiiiice little snooze. I woke up after ten minutes (so I was told), and felt great. 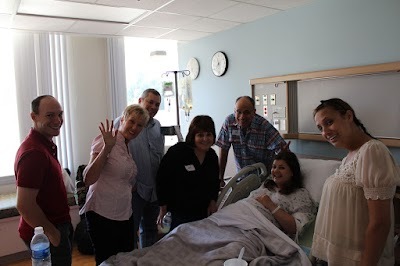 Soon, the surgery was complete and I was wheeled out into the hallway where I was greeted and cheered for by our family and my best friend Kevin and Lisa, who came to the delivery party expecting an earlier baby, but stuck it out to stay for the C-Section. While all this was going on, Bryan was in the nursery with Madelyn where she got poked and prodded and warmed up. She received the anti-infection ointment in her eyes and the Vitamin K to make her blood clot. I’m glad she wasn’t alone and that Bryan could be behind the nursery windows with her during this process. At one point, while I was still in surgery, he looked back through the windows and saw all of our family waiting and watching as their new granddaughter/niece was living her first minutes. I’m so glad Bryan documented this moment. Bryan and Madelyn returned to the recovery room where the three of us bonded and got to know each other. 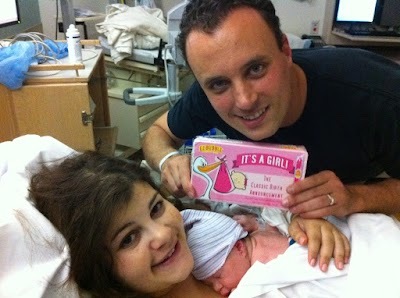 We were both speechless and thrilled to be parents, but couldn’t believe it had finally happened. It’s all a little hazy now, but I remember it being a very sweet time. The family came in to meet her where we announced her long-awaited name, and sighs of love filled the room. It was very surreal to introduce her and officially say her name for the first time. At that moment, she became very real. Because it was almost midnight and it had been a very long day, lots of kisses closed out August 9th with the family’s departure and Bryan and I eventually got adjusted to our new room where we would stay for the next four nights. 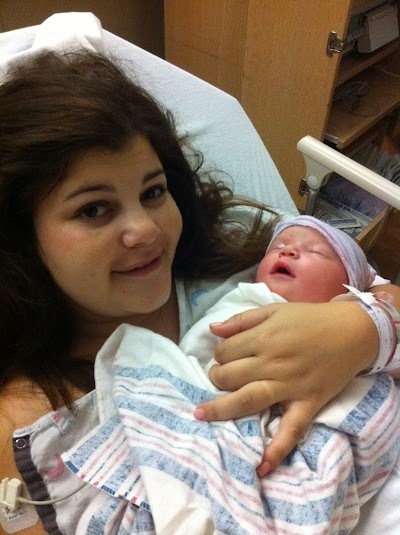 I was hooked up to more IVs including three new antibiotics due to my infection during labor. I even got a shot in my tushie because my face was itching profusely, a common side effect from the epidural drug. Thank goodness that helped quickly! Itchy face is very annoying. Our first night in, I had to get used to the nurses waking me up to administer drugs and check my vitals which seemed almost constant. Madelyn had a slumber party with the other babies in the nursery (ohmygosh there were boys in there! What kind of mother allows her 4-hour-old to go to a co-ed sleepover?!?! Report me at once!) while Bryan and I tried to catch some sleep here and there in our room. And just like that, our baby was born and our pregnancy journey ended. August 9th was a rollercoaster of a day, but it ended on a high. 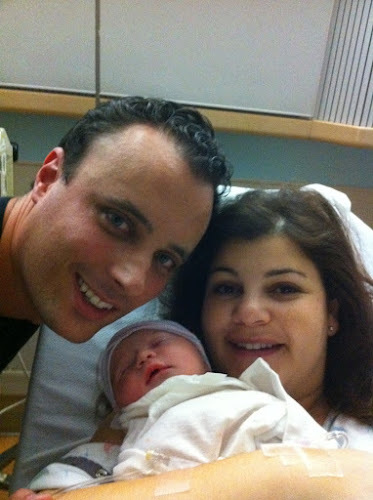 We are so glad that Madelyn is here and can’t wait to write more stories about our life with her in it. Wow, this Is truly an amazing story, thank you Alison (and Bryan, for that matter) for sharing this wonderful and incredibly touching story. I hope I get the chance to meet Miss Madelyn soon, and of course see two of my most favorite theater friends! The pic with everyone in the window reminds me of the movie, “While You Were Sleeping”. The family traveled in a little herd…so cute!! Best. Story. EVER. Mazel tov!! !